To get the most out of your POS system day to day, you need to have the right receipt paper and other POS supply solutions on hand. Interstate Cash Register can provide the stock you need. Just like the hardware and software solutions we sell, Interstate Cash Register carefully chooses POS supply solutions for our customers to deliver the best value. We have a policy not to sell the cheapest brands — they can create lint inside the equipment and shorten the life of the print head. And the line we carry is also not the most expensive. Instead we look for the best quality for our customers at the best prices. With decades of experience working with retailers, restaurants, and grocery stores, we can advise our customers on how to get the most out of their money. We offer a full line of thermal receipt paper in a range of sizes, as well as specialty paper types. 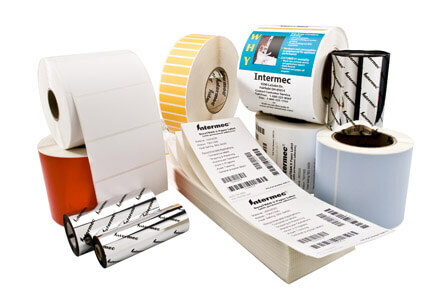 We carry a wide range of labels for your label printers, tags, and preprinted labels for grocery or other applications. At Interstate Cash Register we offer cost-effective replacement ribbons for your receipt and label printers.